Well, there is “Metal” and then there is this record. When I produced this CD for Audiomachine it was an experience like no other for me. Paul Dinletir and I were going over the mastering of Epica at his studio and he played me a few rough mixes from this new project he was conceptualizing. He told me he wanted it to be as hard hitting and heavy as possible. He specifically did not want a traditional ‘trailer’ release this time out. No orchestra in sight, a guitar and percussion based production, with choir. At that first meeting we spoke about how to make a very unique and special record. 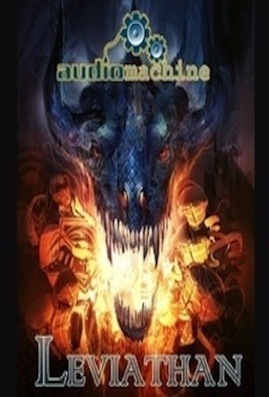 I had not met the Audiomachine team at that time. A few weeks later I found myself sitting at their studio laying out the groundwork for what was to become Leviathan. I had a more than a few bold ideas that I was telling the guys. I knew we were on the right track when I said “Hey, lets use Josh Freese for drums”. They all lit up. I then began to lay out my path of how to achieve Paul’s vision of orchestrating with guitars and solo instruments as opposed to using orchestra. After Josh was booked (to be honest the whole production was based around this unbelievable musician) I then set out to complete the ‘band’. My idea was to get the very best and most eclectic musicians to add their own unique color to the music, and to record them in a world class record room. After Henson was booked I called the finest players I knew. Dave Sutton for his bass pocket and melodic sense. George Doering to add some metal colors by playing and bowing ethnic instruments, as I distorted the life out of them. Tina Guo, not only for her wonderful acoustic cello chops, but her complete metal-ness. A group of the best Taiko players in town. A 60 voice choir. And of course composer Kevin Rix played perhaps the best sounding metal guitars I have ever recorded with a precision that was truly inspiring. Then there was Josh…..
We spent 10 days at Henson having what I would describe as some of the most creative group of sessions of my professional career….. Then the fun started at my mix room……. Right off the bat the sheer power of Josh Freese at Henson was like nothing I have heard. Kevin’s guitars like a wall, Dave’s solid bass pocket, George and Tina’s colors, the punch of the perc, the volume and size of the choir. At times what I was hearing was so massive I just sat back and laughed. I love my job. I spent a month bending this “metal” as far as I could visualize. As with my work with orchestral music, so much production happens in the mix. I envisioned a blend of hard hard metal with some dubstep and aggressive-ambient sections that I would design in the mix. ( I know, aggressive and ambient don’t match… But you have to hear it to understand ). So for weeks I re-sampled, re-amped, chopped, filtered, destroyed, sound designed, twisted and constructed breaks out of the elements we created at Henson to enhance their music. To a great extent this project stands alone with anything I have heard. Paul and Kevin were so gracious with allowing me to have the creative freedom to push their powerful music as far as I did. Thanks audiomachine, this project was a blast!